Emma Kehoe. Photo: Alex Hutchinson. There's a bit in Chekov's Three Sisters where Vershinin says: "I don't remember you individually; all I remember is that there were three of you. Three sisters." This quote rather springs to mind the first time I meet the Kehoes - Ashley, Emma and Claudine (pictured above, left to right). All three are blonde, in shades of platinum, gold and white; and are gorgeous visions in leather, lace and fur, with perfect make-up and manicures. Of course, after a short while, the three separate out into their distinct personalities, individually and in respect to one another. Emma is the eldest, four years older than Ashley, who is a year and eleven months older than Claudine. As Ashley says: "We look alike, but we're very different personalities. Emma is very regimental - very 'get it done!' - and straightforward. Claudine is a bit more laid-back. I probably live in the middle, the peacemaker. I'm Libra as well, so I see both sides of every story. I'm diplomatic." As much as they share a love for fashion, each showing a knack for showcasing exactly those items and trends that the rest of us have been secretly wondering how to pull off, they then branch out into different areas. For Claudine, it's fitness and diet; for Ashley, it is make-up, travel and food; for Emma, it's positivity and female empowerment. All three are influencers - Ashley has over 73,000 Instagram followers; Claudine has in excess of 72,000, while Emma, who came later to the game, currently has 20,000. They post mainly around fashion, generating thousands of likes and 'where did you get thats?' for the outfits they style, put together and photograph. 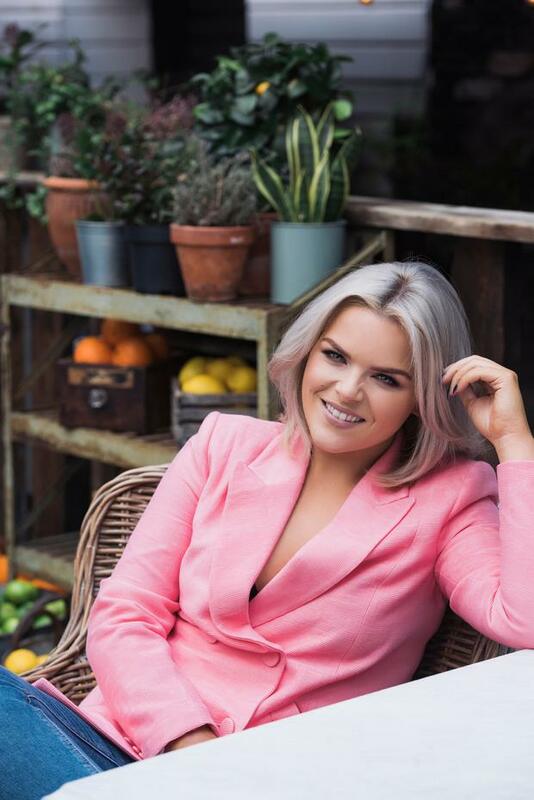 Ashley and Emma both blog, and all three also have 'day jobs' - Emma is a buyer for Penneys; Claudine is in retail management; Ashley works in an anti-aging salon - and until now, their online careers have been moving steadily but organically forward. Now, however, they have decided it's time to ramp up. "The three of us want to work together," says Claudine. "We're going to really get into it as a sister thing this year. We all have an interest and a passion, and we're all different. We have our own separate individual interests, too, that are complimentary." "We're pushing ourselves a little bit more," Emma agrees. "The three of us talked about it at lunch about a year ago, and we all thought, 'This could be something…' It was about believing at the start, and then just going for it." Given the similarities, it was probably inevitable that they would be dubbed the Irish Kardashians, and indeed, it's a label that seems to be sticking. So what do they make of it? "I think it's funny," says Claudine. "It's cute. We never came up with that, but I've heard other people say it. It's lovely that people would... It's nice that is said, but it's crazy too. It's mad that people would think that!" The three grew up in Cabra - their father is an aircraft engineer - and shared a bedroom. "Our three wardrobes were all together, side by side," says Claudine. "There were three sets of posters on the walls." Emma chips in with a laugh: "Claudine was S Club 7, Ashley was Mariah Carey, I was Backstreet Boys. "And there were killings," Claudine continues, "but I loved it. Going to sleep at night, you'd have such little laughs. So many memories and good times. I loved it." Naturally, those years together meant they influenced each other's style. "We had clothes and fashion in common growing up," says Claudine. "On nights out, we all used to go to the same place, and we all got ready together and went out together." "Claudine was only 15," Emma laughs. "She grew up fast. She was allowed to do everything younger than we were." Even now, although they no longer live together, they still connect hugely over clothes. "We'll go shopping together," Claudine says. "If we're going on a night out, we'll be sending pictures of clothes to each other and getting opinions from each other because you don't have them in the room with you any more, so we're WhatsApping all the time." Talking to the Kehoes, it quickly becomes obvious that, unlike in many sibling relationships where a certain amount of irritation, even downright resentment, is in evidence, these three are immensely supportive and encouraging of each other. Emma in particular, as the eldest, seems to set the tone: "Growing up, I was nearly like their second mam. Everyone used to refer to Ashley and Claudine as 'the twins', they were so in sync with each other. They still are. And as much as a sisterly instinct, I've had a motherly instinct towards them as well, but as I've got older and my life has changed, the gap closes. I don't feel I need to look after them as much. "Seeing Claudine evolve into a woman from a tomboy and a teenager, and the same with Ashley; watching them grow up, stand their ground, figure out who they are, was amazing," she adds. "The past year or two, it's like we're all the same age, even though we're all at different stages in our lives." "We've always been there for each other," says Ashley. "In bad times, like relationship break-ups, they are there with advice and a shoulder to cry on, and no judgment. You might break up 10 times, but they're just there for you." For Claudine, "Anything that happens, any issue, I'd be straight on the phone to Emma or Ashley. They can help. They have more knowledge and experience than me, so it's great to have that." It's a bond that is immune to distance and the passing of time, says Emma. "Even though I might not see Claudine or Ashley for a week or two because we're busy with our lives - our boyfriends, work, travelling - when we're in a room together, we have such a close bond. I'm always so excited to see them, because they're my best friends." "We'd never let anything come between us. Family is the most important thing," says Ashley, "which is why it's so exciting to be working more together. It makes our friendship and sisterly bond closer." Asked to describe her personal style, Ashley says, "I never know what to say when people ask me that! I dress to suit my shape - I'm hippy and booby, and I dress for that. I love the clothes Claudine wears, but I can't wear them. I also dress to suit my mood - anything from a tracksuit to glamazon." As well as blogging and Instgramming, Ashley works three days a week in the Kerry Hanaphy anti-aging clinic. "I do their social media, deal with clients and bookings. I love it, and it has opened up a new avenue for interest for me, in skin. I've learned so much. I look after my skin now - I'm 27, it's definitely time I started - and I'm getting asked lots of questions by followers about my beauty regime." Travel is a big thing for Ashley - "last year, I went to Santorini; Cuba; New York; Switzerland; Barcelona twice; and I want to keep doing that, but I want to start visiting more of Ireland as well. That's my resolution for this year: travel more, write about it; vlog it as well." Food and drink are big, too. "Me and my boyfriend, we eat out a lot, and I won't stop doing that, but I'm going to start eating a bit more healthily. I was always into my food. My mam used to say, 'You're a good grubber', but this year there will be fewer turkey burgers!" Ashley is also very honest in what she posts, writing openly about cosmetic procedures, including lip fillers. "Instagram can be very filtered," she says. "It's much better to be transparent. The most important thing is to be true to who you are. And you should love yourself as you are, but if there are improvements you want to make - go for it! I've had lip fillers, and it's about enhancing what you have, not distorting it." She hasn't, she says, had anything else done, "but I wouldn't be opposed to it." She has been equally open about what was a very bad time in her life a couple of years ago - "I was in a very toxic relationship, and dealing with anxiety. I went to therapy for six months and I am determined to say to people, 'If you need help, it's OK to say that. It's OK not to be OK'. "I worked a lot on myself. I think I was an anxious person anyway, and the relationship didn't help. Then, coming into the spotlight with social media, when I hadn't ever done that before, also made me anxious, wondering was I good enough." Her sisters were, she says, "amazing. They said, 'You are good enough. You can do this', and that was what I needed to hear." Now, Ashley is in a good place - "I'm so much more positive and motivated; I have a completely different outlook on life, and I'm much more confident" - and in a good relationship. Recently, she went through a fairly considerable weight-loss journey, down from a size 12, which she documented on her blog to considerable interest - partly for the scale of the transformation, but partly, too, because it didn't involve any kind of crazy diet or workout regime. "I made conscious lifestyle changes," she says, "but quite small things. I started cooking vegetables, I cut out sugar in my tea - I was taking two spoons, in four cups a day - and walking everywhere, and that worked for me. I was very slow and steady. It took two years or so, but I think it's not sustainable to do something like that in a few weeks." And when I comment on the remarkable smallness of her waist and ask did she use anything like a waist-trainer corset, she laughs: "No. I'm a bit blessed - I've really big hips, so my waist looks smaller in comparison!" More recently, she admits to having put on a few pounds, and says, "I'm thinking of doing a body transformation the other way, showing that I've put on a bit, because I want to be truthful, and to show that you don't have to be perfect." This year, she wants to "show more of my personality on social media, chat more, reveal more of myself. I'll always be private about some things - I wouldn't be showing myself in labour, for example - but for me, it's natural to post about most of it. I feel like this will be our year," she says. "I feel it in my bones, or waters, or whereever you feel those things." As the eldest of the three, Emma is the only one to have had her parents, and a bedroom, to herself, for a while, anyway. "Even though I was only there for four years on my own, I think I got spoilt a bit," she laughs. True or not, being the eldest has given her a strong focus. "I'm driven - if I want something, I won't stop till I get it. I'm that type of person anyway, but maybe being the eldest makes me more so." I got the Fashion Wheel for a present one Christmas when I was 11 or 12, and I loved that. I liked colouring and designing, and I used to help my nana doing bits of sewing and embroidery, so then I decided I want to be a designer." She studied fashion design, but realised it wasn't really what she wanted. "I realised, 'I don't want to do this!' I don't see a catwalk there for me. So I did another course in fashion merchandising and visual display, and that was perfect - a bit of travel, a bit of business, a bit of fashion - I loved it." At the same time, she began to experiment with her personal style. "When I was 18 or 19 and started in college, that's when my love of dressing up really came through. I used to be a lot heavier when I was younger," she says, "and I never had the confidence to dress. Then, I lost a lot of weight when I was about 17, and I got my confidence and started finding myself. When I went to college, I started being really adventurous with my clothes." At that time in her life, Emma was, she says, "a big stress-head. I'd worry about things I couldn't do anything about - about Ashley and Claudine, and their jobs. About things at home. If I had a deadline, I'd stress about that." It took a spell living in Australia to give her perspective. "I began to learn, 'Don't take life too seriously, don't sweat the small things'. I began to realise you have to live in the moment, take everything in your stride and believe that what's meant for you won't pass you by." Now, she says, "I'm really into reading books like The Secret, and I really live by that motto. These days, I always turn a negative into a positive. If I've had a bad day, I'll be like, 'OK, that went wrong, but it went wrong for a reason because now this is going to go right…' That's how my drive and positivity come out. I don't like to have a negative outlook on life, because I feel like you get that back. I sound like a hippie-dippy…" she laughs, "but I believe that you attract what you put out to the world." She regularly goes to see a kinesiologist. "She's like a life coach - she teaches me to meditate, to take time out for myself. I breathe, I go to yoga, I need that balance in my life. Claudine goes to the gym, that's her zone. Ashley sketches, that's her little thing; we all have our own way to bring ourselves home." Family is hugely important to Emma. "My dad has a really big family - five brothers and five sisters - and anything family, I'll always go. When we were younger, we went to every family event. Those are our values, and as you grow older, you try to commit to that. I always try and make an effort. Every Thursday, religiously, I go and see my nana. One granny lived round the corner from the other, so as children, we'd go between the two. We're really lucky to be so close and still have our grandparents. They're the wiser ones, they have the experience and we should listen to them." Emma started working for Penneys over 10 years ago, and her job as a buyer takes her all over the world. "I came back from China two weeks ago; I was in New York. I don't mind the travel, I enjoy it. Because our dad is an aircraft engineer, we were always confident travelling. We were very used to planes and went on holidays every year - Florida, Portugal. We were very fortunate like that. There are stressful days, but I wouldn't change it. I love it. I couldn't do nine-to-five in a bank." This year, Emma has big plans: "To give blogging more time. I've just moved into my house, so I want to put effort into that as well. I might do a course in life coaching, and I'd love to do personal styling. That's a goal for me. I'm all about body confidence and empowering women. I want to lift women up, give them confidence, and let them know you don't have to be a size six to wear what you want. From being heavier, and as I got older, I think I've evolved and matured, and I just want to get it out there. The idea of working with Emma and Ashley, it's obvious, because we all have our separate interests that work together. We're putting it out to the universe…"
'I was always the tomboy," says Claudine. "I was into sports - Gaelic in particular - which my sisters never were. Until my little brother was born, I was the boy. I went to all the matches with my dad. Then, as I got into my teens, I grew out of that and got into dressing up, clothes and shoes and make-up, and I grew into myself a little more. It was great to have Emma and Ashley for that - Emma's always been so confident with her fashion; it was always great to get her opinion. I'd be a lot quieter than Emma or Ashley," she says, "but once I get going, I'm grand." With less than two years between her and Ashley, Claudine says that the two did everything together - "We went to school together, lived together, worked together. Ashley got a job in River Island when I was 16, so I got one too. Only part-time, because I was still at school, but I loved it." When she finished school, Claudine moved to a different boutique, where she specialised in visual merchandising. "I really loved that. You had your own section to arrange whatever way you wanted, your mannequins to style; new stock coming in all the time." Instagram, too, came to her through Ashley. "She was really into it from the start, back when it was just small. She was getting clothes sent to her and taking photos, and I started taking photos for her. I didn't do it at that stage - it wasn't a big thing then in Ireland, but she got such a massive following. So then I started putting up outfits, things I liked, things I wore, and I just started to get a following without ever trying to promote myself. It just started happening. I was never out to get it as such, and I'm so grateful." Her style is noticeably distinct from Emma or Ashley. "I'm very kind of plain," she laughs. "I wouldn't be very colourful - Emma loves her colour and her prints. I don't really like dresses. I love flared trousers, palazzo pants, oversized jumpers, I love blacks, greys, and nudes. I will branch out sometimes with a bit of colour, but not that often. I'm real picky with clothes, I'll only wear certain fits, certain colours and shapes." And when it comes to make-up, "Anything Ashley uses, I'm like, 'Great, I'll get the same, because if it suits her, it'll be grand on me!'" Working out and fitness are big parts of her life. "I'm really into it. I love going to the gym, getting out and doing walks. I'm going to get really into that this year." So what's her routine? "I'd go to the gym every morning at 6am before work. People ask me, 'How can you get up that early?' It's just a routine. Do it for a couple of weeks and your body gets used to that. I go for an hour every day, and I enjoy it; that's my little happy place. I love being there. I don't feel, 'Oh my god, I've got to go to the gym…' If you're forcing yourself, you won't go." Doing more of this, and documenting it, is part of Claudine's plan for the next year. "What I love is taking photos, having fun, being myself - I want to stay true to who I am. I only post things that I love, and I love the fitness part. People ask me a lot, 'What are you doing?' I want to start videoing some of my workouts and posting them. It's hard to explain [my workouts] exactly; it's much easier to show them. I want to travel Ireland as well, so maybe the three of us can do that together. Our dad has a camper van, he goes to Electric Picnic with it, so maybe a road-trip? The Kehoes Do Ireland…"
Will she move into the diet space as well? "Probably, because it makes such a difference; even with fitness, they will tell you so much comes down to diet. My diet isn't crazy-strict, I'd still have treats for the weekend - I have pizza, because I'm hooked on it. But Monday-to-Friday, I try to be good. My boyfriend is so into fitness as well, so the two of us do it together, and we're both motivated, which is great. If he was eating whatever he wanted and I was trying to be good, that would be hard. The relationship might not last!" Storming the social-media world along with Emma and Ashley isn't, for Claudine, such a big deal. "Even before social media, we'd talk about this stuff," she says. "We'd go shopping together. If I wasn't sure about an outfit, I'd take photos and ask them what they thought - they'd just tell you straight up, yes or no, and I'd take their view. Whatever we do next - working with more brands, doing TV, working harder - fashion is what brings us together."